Rice is an important food source in Ghana: it ranks as the country’s second most important food staple. 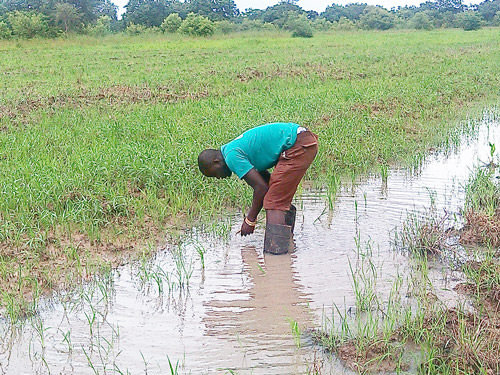 Northern Ghana has a comparative advantage in rice production. This is showcased by a recent large investment in rice processing in the region by the Avnash Group, providing a major new opportunity to transform the rice production system to make it more responsive to the market, and to work better for the poor. In addition to being a staple food for the urban population, rice is also an important staple in the communities where it is produced. A breakdown of price differences between imported and local rice shows that many Ghanaians are willing to pay significant premiums for the better quality imported rice. 70% of rice sold through retail outlets in Ghana is imported. Increase farmer access to certified seeds – particularly aromatic varieties with high market demand – through the promotion of private sector involvement in seed multiplication. Our diagnostic work showed that currently rice farmers mainly use recycled seed, typically of varieties not demanded by the market. The commercial seed market is severely underdeveloped, capable of supplying seed to a small fraction of the actual area under rice cultivation. MADE is working with public and private sector entities to improve coordination between them to ensure high quality seeds are made available to smallholder farmers. MADE is working with seed companies to ensure they are able to produce quality certified seed. Improving farmers’ access to end-markets by working with aggregators to improve the services they deliver to their out-growers and facilitating access to major top of the supply chain buyers. When undertaking the preliminary market screening, it became evident to the MADE team that market information failures and remoteness from markets in the South created huge information asymmetries and power imbalances. Contract growing as a model was also identified as a potential bottleneck due to lack of contract enforceability. MADE is leveraging its market knowledge to broker relationships between top of the supply chain buyers, such as Avnash, and established aggregators in the three northern regions. To ensure aggregators are able to meet the supply requirements of these top of the supply chain buyers MADE is supporting aggregators to develop models which will ensure the effective delivery of services (incl. GAP) and inputs to their out-growers. Helping women who process and trade in parboiled rice with BDS to enable them improve their access to finance to grow their business. Our diagnostic work singled out the crowding-out of women processors as a potential effect of the above interventions: parboiling rice at a small case is a source of livelihood for women in the north. MADE is facilitating the introduction of BDS products to women traders and processors in the North. During the 2015 rainy season, over 5,550 farmers participated in our partner facilitated field days. In 2015, MADE has brokered relations between 10 rice aggregators with an outgrower outreach of 8,450 smallholder farmers, and top of the supply chain buyers such as Avnash.